Well another few days of Aidan growing and healing. While Aidan was in surgery Laura wanted to get him a Build-A-Bear and picked out "Champ". 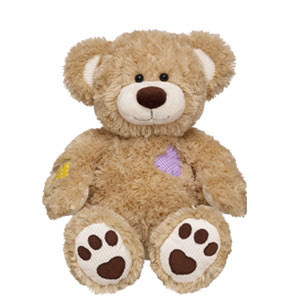 He's a cute bear with patches in support of children's health issues. Laura borrowed a pair of sissors from the Workshop and cut a small hole in the bear for his MicKey / G-tube. We both wanted the bear to have the feeding tube Aidan has. Unfortionatly Laura and I are aguing over if the bear should keep the MicKey after Aidan has his removed. So we both decided to put a poll up on the Blog to let you decide! G-tube. It will always be a part of Aidan's history. We are going with G-Tube to stay in, at least until Aidan is old enough for you to explain to him and let him see & touch it.